The Designer Search website is CLOSED as of November 2014. We have decided that the concept of the Designer Search site was too similar to the concept of the Fashion Industry Network. Please visit our new site called the Fashion Industry Network. If you are a fashion designer or are looking to hire a fashion designer, we strongly suggest you try the DesignerSearch.com website. The Designer Search website is a free online fashion portfolio service. Designer Search is a FREE tool intended to assist fashion and textile industry artists / designers / design studios and companies that are searching for assistance with design functions, find one another. Fashion and textile industry artists can utilize this tool to post their design portfolios and basically advertise their talents while potential employers can utilize Designer Search to find the artists who they would like to consider working with. Artists/designers can create and modify a Designer Search profile for themselves by utilizing our simple to navigate administration area. Designer Search profiles can include portfolios of design images and contact information. In an effort to assist artists who wish to freelance on the side, we have included a method for anonymous communication. This will allow a potential employer to contact an artist without seeing the artist's full contact information. After the designer / artist, receives the first correspondence, they can decide if they wish to respond to the potential employer and only at that time the potential employer would learn the designers contact detail. Designer Search is a free tool that can provide a meeting ground. Simply stated, this is a "match making service" to assist with business activities relevant to DESIGN aspects of the fashion industry. All communication, design approvals, price negotiations, payments etc., will be between the buyer and seller of design services. Designer Search is not involved with the transactions between artists and employers. All business dealings are strictly between the artist and employer. The Designer Search b2b portal is for clothing and textile design only. If you offer fashion industry design services, you are welcome to create a profile. How does an online portfolio help me? Simply stated, Designer Search is a "match making service" to assist with business activities relevant to the DESIGN aspects of the fashion industry. All communication, design approvals, price negotiations, payments etc., will be between the buyer and seller of design services. Designer Search is not involved with the transactions between artists and employers. All business dealings are strictly between the artist and employer. 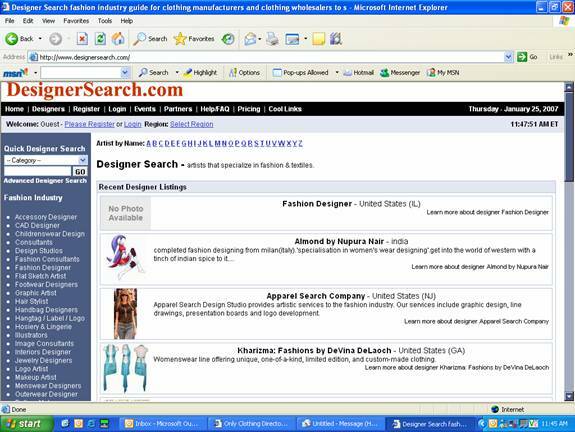 The Designer Search b2b portal is for clothing and textile design only. If you offer fashion industry design services, you are welcome to create a profile. In an effort to assist artists who wish to freelance “on the side” (while maintaining employment else where) we have included a method for anonymous communication. This will allow a potential employer to contact an artist without seeing the artist's full contact information. After the designer / artist, receives the first correspondence, they can decide if they wish to respond to the potential employer and only at that time the potential employer would learn the designers contact detail. Full Page Profiles: Once you register you can create full page profiles with several images, a link to your web site, a map to your business and more. You can also include your company logo and your own photo. Events Calendar: Registered users may submit events for inclusion in our events calendar free of charge. PLEASE post only fashion related events. If you have a fashion runway show, design seminar, trade show appearance etc., you are welcome to post your event. Photo Galleries: Registered users may submit photos to be included in our photo galleries. Not all photo's will be accepted, but high quality photo's of interest to our site visitors are another way you can highlight your business or area. I am an aspiring artist seeking employment in the fashion industry. How do I find employment? Well, it is funny you should ask. The Apparel Search Company has actually launched a new web site that has been developed for precisely the purpose of finding you a job. As luck would have it, you are actually on the site as we speak. The Designer Search portfolio service has been developed with the sole purpose of matching qualified artists with clothing industry companies seeking to hire artists for freelance assignments. If you are searching for full time employment in the fashion industry, try the Clothing Industry Jobs website or the Fashion Job Search website. If you own your own design studio or wish to participate in freelance or part time assignments, please read on... As a fashion industry artist, you are permitted to register for a FREE account on Designer Search. This account will allow you the opportunity to develop your very own designer portfolio. In a nut shell, the portfolio is a method for you to promote your professional biography as well as images of your past and present illustrations. After your account is set up and your portfolio is created, you are welcome to login at any time to edit your portfolio with updated bio information or new images.